Buy Impulse Foods Organic Tempeh - 227g in the UK from our online shop or directly from our independent Scottish store. Tempeh or tempe is an excellent vegan source of protein. Tempeh is made by a natural culturing and controlled fermentation process that binds soybeans into a cake form. For extra flavour marinate this natural tempeh for a couple of hours before using in stir-fries, oriental dishes or soups. Tempeh can be used as an alternative to meat. Tempeh is made from fermented cooked soya beans. It is very popular in Indonesia and other Eastern countries. The firm texture and slightly nutty flavour makes tempeh a flavoursome alternative to tofu. This recipe contains 250 g tempeh, cut in 1 cm cubes. We sell real Impulse Foods and other Frozen Foods directly from our shop in Scotland and online throughout the UK. View more products from Impulse Foods. Where can you buy real Organic Tempeh safely online? 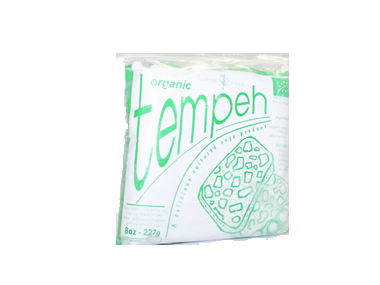 If you are wondering where you can buy Impulse Foods Organic Tempeh - 227g safely online in the UK, then shop with us. We are an actual health foods shop; with real people selling real foods and products. Our award-winning independent shop is located in Stirling, Scotland since 1976. You can buy our Frozen Foods in store or safely place an order with us online or over the phone. Organic Tempeh - Impulse Foods Organic Tempeh - 227g in Frozen Foods and Foods.